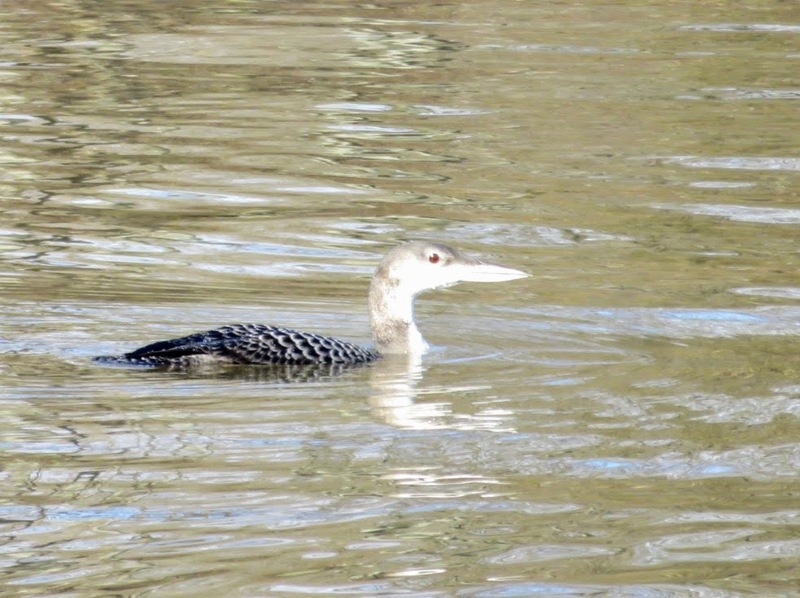 Thanks to Melinda Varian for sending her husband Lee's photos of a loon that's been visiting Carnegie Lake. "We were standing on the footbridge that goes across where the (Millstone) river goes under the canal into the lake. A man we talked with said that he has been seeing it in the lake for about a week." Another local birder, Laurie Larson, who keeps tabs on bird populations, said she could recall "one or two records over 30 years. It certainly is not “common,” although it is a Common Loon! I’m glad it’s finding Princeton hospitable." 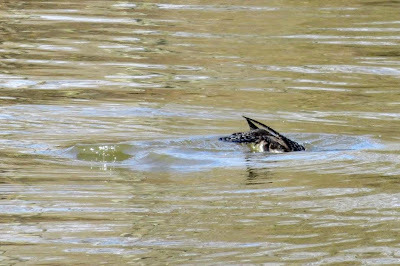 One has to be quick to photograph a loon. A more common shot catches the tail feathers as it dives in search of a meal. For fun facts about loons, check out this Cornel site, which explains that loons have solid bones rather than hollow, in order to be heavy enough to hunt effectively underwater. As a result, "Loons are like airplanes in that they need a runway for takeoff. In the case of loons, they need from 30 yards up to a quarter-mile (depending on the wind) for flapping their wings and running across the top of the water in order to gain enough speed for lift-off." Because of this need for a long aquatic runway, loons can get stranded in small ponds, or on wet pavement that they mistakenly land on, thinking it to be water. 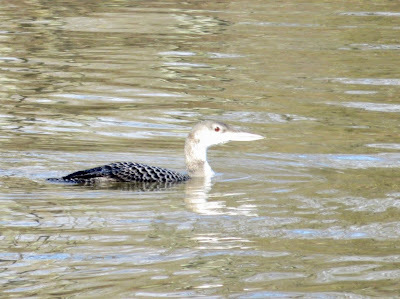 Our visiting loon chose its lake well, as Laurie explains: "Fortunately if the weather freezes up, there’s plenty of water for the long wind-up and take-off that loons need, and this one can head for Cape May." Update: It's a bit disjointed in this video to see all the scenes packed together, but loons play a starring role with Kathryn Hepburn and Henry Fonda in On Golden Pond. Even in the winter, or maybe especially in the winter, there's a lot of creativity and beauty in our backyard, thanks to a fillable-spillable 35 gallon black tub that catches runoff from the roof. If the night dips below freezing, the open water becomes a canvas for elaborate 3-dimensional designs. Why the water doesn't freeze flat is hard to fathom. Sometimes, if the night's freeze has been light, these geometric shapes will frame miniature pools of open water that jiggle when the tub is tapped. Cold brings out an unexpected beauty in water, and sometimes in ourselves, if we have clothes to match the weather, and take the cold as a bracing stimulant rather than, as Garrison Keillor would say, "nature's attempt to kill us." These images were first posted at VeblenHouse.org as News Flash: Nature is a Geometer, in a post that links to an Exploratorium exhibit that shows how supercooled water can freeze over in a flash. Acorns, anyone? It's called "flooding the zone"--a technical term commonly used by botanists who grew up playing sports. Some people see it as a mess, and curse the trees. An alternative target for cursing, just to put it out there, would be the tree-phobic landscape of concrete and lawn that we impose beneath the trees. A forest floor is far more accommodating of arboreal excess. There, a tree can let it all hang out, let it all fall down--seeds of all sorts, leaves, branches--and the forest floor will shrug, take it all in, and turn it into wildflowers. In town, the blanketing of acorns turns into a blanketing of oak seedlings, few if any of which have any prospects of reaching maturity. The seedlings seem to be saying, "Move me to an opening along the street where I could shade some asphalt", but it doesn't look like people are listening. For some people, a love of trees is layered with deep resentment of this fecundity. For me, looking for logic in nature's ways, the question is not "What to do with it all? ", but "What's missing?" Past posts about osage orange and honey locust ask the same question, and suggest a missing herbivore that would have consumed the abundance in the past. Botanical abundance has lost a once complementary zoological abundance. A partial answer came this past Nov. 10, when masses of starlings swept through, congregating in the pin oaks behind our house. A closer look revealed they were gobbling down acorns. Minutes later, they were gone, having left our pin oaks a little lighter. The starling is not native, though, so doesn't speak to what would have consumed the oaks' abundance historically. And starlings appear too small to deal with the larger acorns of other species such as red oak. Still, it's behavior suggests that the spectacular fecundity of oaks might once have fed a complementary fecundity in the avian world--some highly mobile species, large enough to deal with a broader range of acorn size, that could make quick wing across eastern North America, swooping in to feast and move on. Enter Ectopistes migratorius, a.k.a. the passenger pigeon, a bird of spectacular mobility and historical numbers. The photos are from a wonderful NJ State Museum exhibit two years ago. A fine writeup on the Smithsonian website says "the mainstays of the passenger pigeon's diet were beechnuts, acorns, chestnuts, seeds, and berries found in the forests." They may also have swept in to feast on the seeds of our native bamboo, Arundinaria, which at one time covered large areas in the southeast and, like other bamboos, typically bloomed only once every several decades. It can be tempting to say that the starling is providing a service by partially filling the void left by the extinction of the passenger pigeon. A few books have come out in recent years that claim invasive species like starlings aren't a big problem after all. The books in turn embolden news editors to publish articles and opeds with a similarly seductive revisionism, showing the same willingness to cherry pick evidence and rush to conclusions. I've written detailed critiques of various of these, including one recent article that mentioned starlings. It would be interesting to explore to what extent the massive numbers of starlings have filled the niche left empty by the extinction of the passenger pigeon. Though feeding habits may overlap somewhat, one big difference is likely to be nesting behavior. Starlings compete with native birds for nesting sites, while the passenger pigeons appear to have built nests on branches, where they would not have displaced birds seeking tree cavities. After days of deep freeze, the temperature rises towards the 60s, and the squirrels are frolicking in the trees. By the tens they go. By the tens!? They flow like a spiraling current up trunks, out branches, leaping tree to tree, thinking three dimensionally. So cute and breathtaking, these acrobatic rats with charismatic tails! And so thoughtfully integrated, like the ads, with one black squirrel mixed in with the gray, all at ease and thrilled by the heady weather. Might humans, too, festering in ancient animosities, fall into long winter's slumber, then awaken in a January thaw to a fresh world redolent and warm, where life moves forward in leaps and bounds, and all fear of difference has been forgotten. For a long time, our chickens stuck to the straight and narrow. They lived as everyone expected them to, spending their days scratching and pecking at bugs and worms in the yard, nibbling seeds off the grass, turning all that foraging into eggs, then dutifully returning to the coop each night to sleep, or whatever trance-like state chickens attain while roosting. We in turn would dutifully feed them, open and close the coop door each day and night, and gratefully, somewhat guiltily, make off with the eggs. My respect grew for these gentle Araucanas, going about their days, so purposeful, so competent, so giving in their convenient repackaging of nature's abundance. When arctic air swept through, they would roost in the unheated coop as always, then step spryly out of the coop the next morning, impervious, as if antifreeze coursed through their veins. The relationship started to change, though, a year or so ago. Perhaps the four chickens had depleted our yard's supply of wild food. They discovered they could cross over the back fence, and find fresh gleanings in the town park. I began getting reports of the great delight they were bringing to kids and parents. Then they ranged farther afield, three doors up to our neighbors' backyard, where they could gorge on birdseed spilled onto the ground from the birdfeeder. They still dabbled in our tray of standard issue chickenfeed from the farm supply store now and then, but you could tell their standards had changed. They were developing new tastes, new friendships. They continued returning each night to sleep in the coop, and continued supplying eggs. We thought ourselves so lucky, to be reaping the harvest of eggs and pleasant anecdotes these beneficent creatures produced. They were like salmon, feeding broadly, then returning with an uncanny homing instinct to feed us generously. But then one of the chickens stopped showing up at the coop at dusk. We worried that a hawk might have gotten it, but our neighbors would report seeing it during the day. Another chicken disappeared altogether, considered gone for sure until a neighbor on the other side of the park sent word that it had adopted her yard. She loved how it would come running to her when she brought it food and water. I tried to retrieve it, but the chicken clearly did not want to be caught. The freedom of coopless living ultimately seduced them all. Our coop lay abandoned by the birds it was meant to protect. We'd spot them sporadically, in front yard or back, or up at the neighbors' as they made their daily rounds. No one knew where they were roosting, nor where the eggs, if any, were getting laid. We thought of catching them and closing them in the coop for a few days to get them back into old habits, but in a way they've outgrown that old domestic servitude, the grind of laying egg after egg to serve the master. They've discovered an old forgotten resourcefulness, awakened dormant capacities deep in their genes. It seems a dangerous life, unprotected at night, and yet they survive. It helps that the foxes don't get up this way, and raccoon sightings are rare. Last week, I had been up very early and was just heading back to bed at 7am for a brief doze when I heard a blood curdling screech just outside our bedroom window. I ran outside with a coat over my pajamas and peered into the bushes. A coopers hawk burst out, flying right past me and up to a tree nearby. Such magnificent creatures they are. I peered more closely at the ground next to the house and saw the brown chicken, motionless in the window well. Surely it couldn't have survived such an attack, but then its head suddenly popped up. It jumped up out of the window well, gave me a quick look, then disappeared under the shrub. It had lost a few feathers, but otherwise looked fine. The feathers of a chicken, I'm realizing, provide not only magnificent insulation and some modest flying power, but also serve as a shield that confounds predators' attempts to penetrate it. The predator ends up with a feather in its mouth while the bird scurries away, and the rachis--that stiff central stem of the feather--serves collectively as body armor. Of course, if I hadn't shown up, the coopers hawk would have ultimately had its breakfast, lunch and dinner, and we would have grieved. The chickens' choice of freedom comes with risks. and leave food nearby, under a recycling bin that got broken being used as a target for backyard lacrosse practice, then got partly consumed making trail signs for a local preserve, and now has a new life keeping rain and snow out of the chicken feed. There's collected rainwater to drink in the fillable-spillable tub in the backyard. If a big snowstorm comes, we may pluck the sleepy chickens from their roost and put them in the coop for the night. We're letting them make up their own life as they go along, which may include a return to the coop. Yesterday, I saw the brown chicken walk over and disappear into the coop. Later on, I stopped in to find two fresh eggs, the first laid there in months. Maybe that's how a chicken says thank you if you save its life. UPDATE: After six inches of snow fell, the chickens looked like they were going to stay up in the bushes all day, to keep their feet warm. We plucked them down and closed them in the coop for a couple days until the snow melted (this winter's like North Carolina, not New Jersey). then roosting again in the bushes next to our house for the night. It's interesting to see how they keep their feet warm while roosting, by squatting down so their feet disappear under the puffed up feathers. Eggs from our "Easter egg chickens". In a new twist, the egg on the right has two shades of green.